That evening a large number of flares and blinking lights were reported from the vicinity of defense plants. Photograph appeared in the LA Times. Lieutenant George F. Gorman. It was blinking on and off. Additional disk joined the formation, lights on all eight blinked out, then came on again. White elongated object flew very fast then blinked out. One white light blinked 2-3 times per seconed as it moved very fast across the sky in 15 seconds. As the reddish, glowing UFO flashed on and off, two smaller objects approached and merged with it. After a few minutes, the two smaller objects broke away. A confidential communique issued by the Combat Operations Center of the North American Air Defense Command (NORAD) on November 11, 1975, reported that "...as the interceptors approached the lights went out. After the interceptors had passed the came on again One hour after the F-106s returned to base, missle site personnel reported the object increasesd to a high speed, raised in altitude, and could not be discerned from the stars." Source: APRO Bulletin, February 1985, p. 8. A disc with an orange halo hovered over a park in Cape Girardeau, Missouri at an estimated altitude of 1,000 feet. It winked out after fifteen seconds. A lady reported she saw a dark gray object like a "cracker box" with very bright lights on each end. The lights blinked on and off alternately. In a windy & rainy night the witness's 6-year-old son and 10month old daughter were in the living room watching TV. This was in the top floor of a 3-story apartment with a huge window overlooking a cow pasture. Her son suddenly started screaming and the witness ran to see what was going on. She then saw something going over the building at very close range. It was a well-rounded, triangular shaped, black "machine." It apparently came very close, as the witness was able to see raindrops on it. 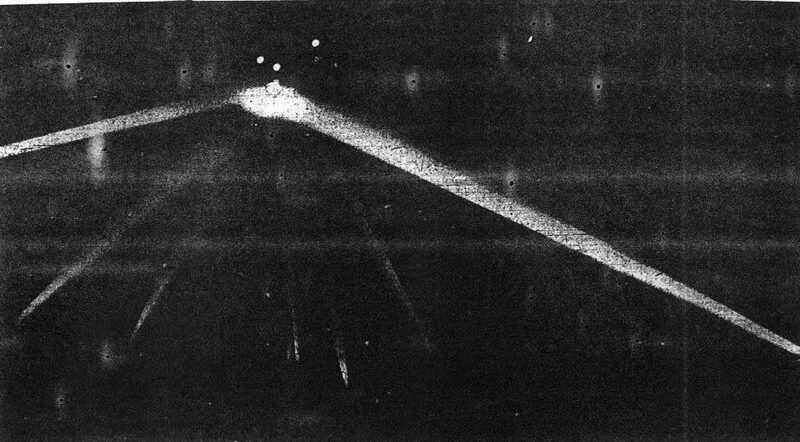 The object had a ridge around it with red lights, blue lights along the bottom, and a round dark spot in the center. As it went over the building, 2 red lights, 1 on each side, blinked off and on 4 times. 4 beeping sounds accompanied this. After getting a better look the witness noticed a dark bulge hanging out the bottom, and 3 small rounded windows that were dimly lit with yellowish light. Through a pair of binoculars the witness was able to see movement like a shadow behind the middle window. Soon after this incident the witness phone began to behave strangely, ringing at all hours, when she answered it, it was just loud static. The fire alarm system also went haywire in the building. Camped near a ridge the witness had been seeing red, blue and green object go over the ridge many time late at night. This night he camped on top of the ridge directly northeast of his home. He took his binoculars and saw an oval disk shaped object with blinking lights and making a low pitched humming sound. It was over the ridge in a small clearing. He did not see it until its lights came on. It hovered there for a while, he looked through the binoculars and saw what appeared to be a porthole or small window, and he could also see a humanoid shaped head wearing some sort of helmet. This frightened the witness who decided to climb down the ridge and go home. At this point the craft does look like it could be circular/saucer type form. The second time I saw the craft it was much more saucer looking; the lights were more in line now. One large craft flying from west to northeast; large, with blinking lights of various colors (the notable ones being red and white) possibly a saucer style.